November 2017, Dublin, Ireland We are announcing the development of a new certification standard for Whole Home Air Cleaners, also known as In-Duct Air Cleaners. As allergen avoidance in the home is now accepted as part of a preventative treatment plan for those with asthma and allergies, it seemed very important for us to develop this new standard to help people improving their “home health”. “We have developed this new standard to help people identify products in this category that have been proven appropriate for those who want to reduce allergens and improve air quality in their entire home,” said Dr. John Ryan, Head of Strategy at ASL. “It is essential for the HVAC industry to think in innovative ways and to explore the many issues related to indoor air safety and quality. In fact, the whole concept of energy efficiency along with risk avoidance around health issues should be seen as a massive opportunity for the industry”. Products that pass the new standard will be able to get the asthma & allergy friendly®® certification. The standards that we develop behind the asthma & allergy friendly®® Certification Program serve two mutually reinforcing objectives. They help consumers identify products more suitable for people with asthma and allergies, and they also allow manufacturers and stakeholders reach for meaningful targets and be reassured that they can stand over the promises they are making. This latest standard was developed to help manufacturers of whole home air cleaners to demonstrate that their products meet our rigorous allergen removal performance criteria. This new standards will now enable us to certify whole home air cleaners as asthma & allergy friendly®®. It will mean that companies that pass the standard will be able to join one of our Certification Program, run with patient advocacy groups in North America or internationally. As consumers face significant challenges in understanding information on the performance of air cleaners, particularly when they are making buying decisions that take into account family members with asthma, allergies or hyper-sensitive airways, this new standard is a new step to help consumers making healthier choices. When consumers will see the asthma & allergy friendly®® label on products they will know that this product passed our strict scientific standard. The Trane CleanEffects™ whole home air cleaner is the first product to pass the whole home air cleaner standard and to be awarded asthma & allergy friendly®® certification. Trane is a leading global provider of indoor comfort systems and services and a brand of Ingersoll Rand. The Trane CleanEffects™ whole home air cleaner met the strict requirements of our Protocol 08:06 by demonstrating under testing in approved accredited laboratories that it reduces exposure to allergens in the home. This testing included evaluation of the product’s capacity to remove allergen and other particles, as well as its capacity to remove particles during accelerated loading and post-cleaning. These capabilities are tested using a range of allergens. Products must also comply with strict limits on ozone emission. This new standard complements the suite of existing standards that we have been developed, including standards for furnace filters, air conditioner filters, portable air conditioner units, and dehumidifiers. 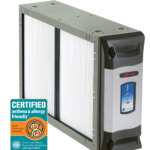 asthma & allergy friendly®® Whole Home Air Cleaners Option” width=”150″ height=”150″ /> INGERSOLL RAND AIR CLEANER PASSES CERTIFICATION STANDARD The Trane CleanEffects™ whole home air cleaner from Trane, a leading global provider of indoor comfort solutions, has passed the relevant Certification Standard.